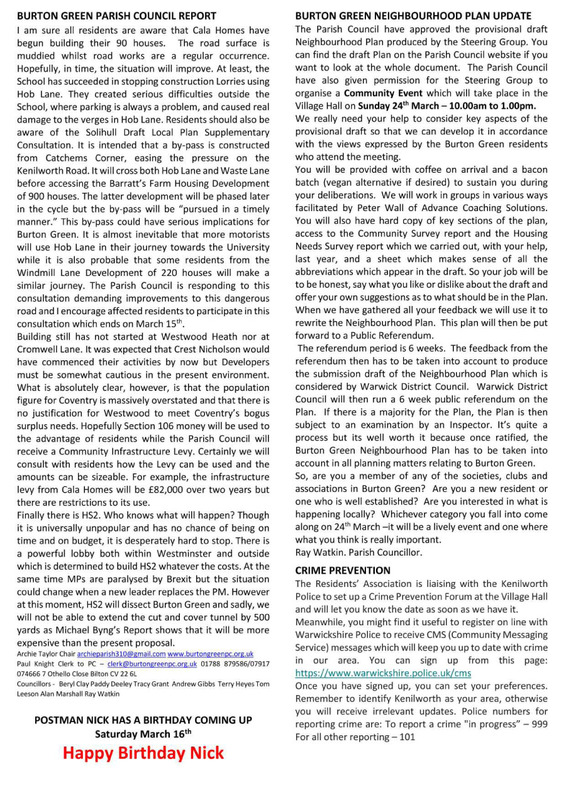 The Burton Green Residents' Association Privacy and Data Protection Policy can be viewed here. Janet Hickinbottom (secretary), Judi Hibberd (secretary), Dianne Adams (treasurer), Mary Webb (Bugle), Andy Gibbs (HS2), Bron Putnam, Hilary Cox, Faith Ward, Paddy Deeley, Trish Hancock. The Residents' Association continues to make a consistent effort to keep our environment as attractive as possible. A number of residents litter pick on a regular basis, some collecting litter every time they walk down the road — an amazing contribution to our community. If you would like to help with this and need a "grabber", please let us know. 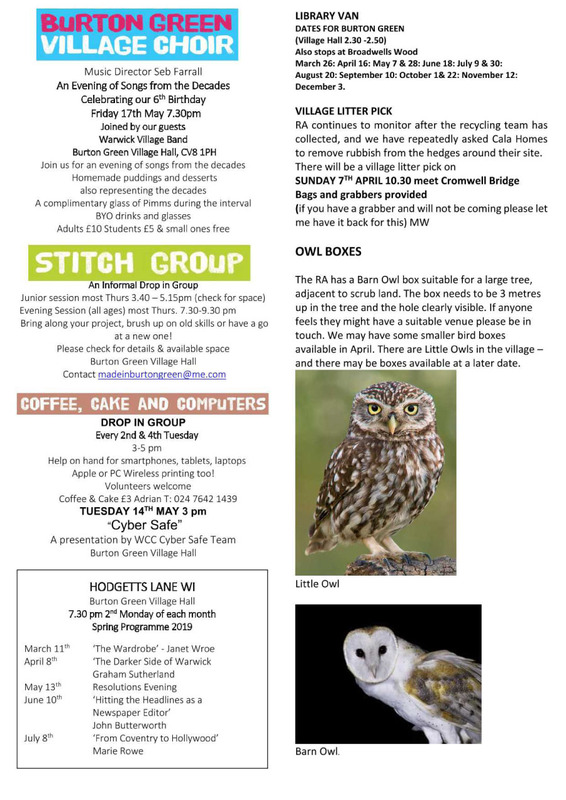 We are in touch with a Warwickshire group called Rubbish Friends and the Warwickshire Waste Partnership so that we can network and pick up on any good ideas that emerge. We have enlisted the help of Burton Green Church of England Academy pupils who are taking part in competition to design a poster to discourage drivers from throwing litter out of car windows. Winning designs will be reproduced professionally and displayed on our roadsides. Fly tipping and rubbish in the Red Lane hedges has been reported to Warwickshire District Council and Carla Homes construction workers have agreed to help with its removal. Mud on Red Lane from the construction site has been an ongoing problem and the road cleaning vehicle is a permanent feature at the site. 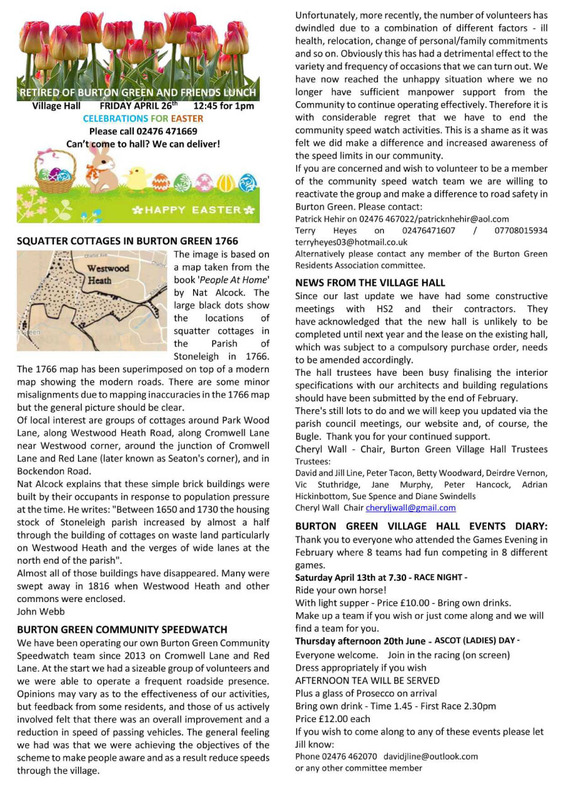 Our next lunch for the retired and friends of Burton Green takes place on Friday April 26th. These lunches have been a huge success over a number of years; they are always very lively social occasions with excellent food. Canley Community Centre received a cheque for £500 at the Balsall Common Lions' annual charity awards evening, February 25th; this sum was collected in Burton Green on the Santa Sleigh evening, December 14th. 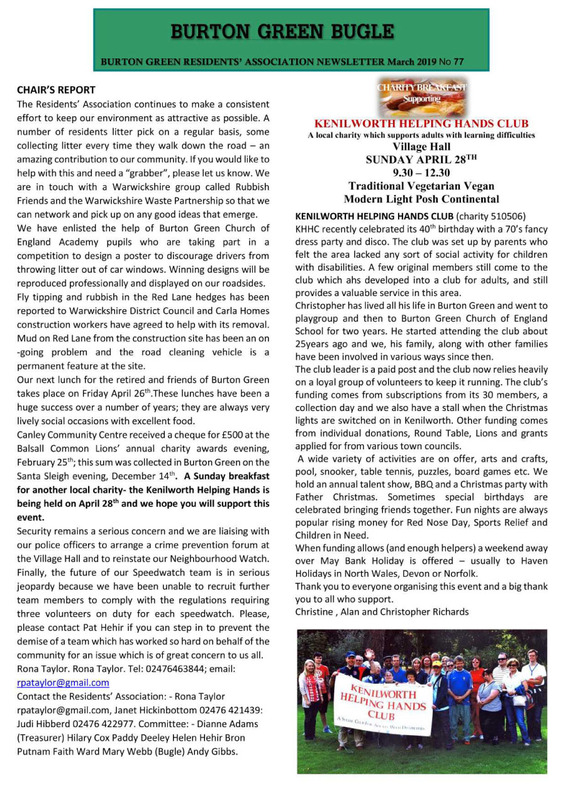 A Sunday breakfast for another local charity- the Kenilworth Helping Hands is being held on April 28th and we hope you will support this event. Security remains a serious concern and we are liaising with our police officers to arrange a crime prevention forum at the Village Hall and to reinstate our Neighbourhood Watch. Finally, the future of our Speedwatch team is in serious jeopardy because we have been unable to recruit further team members to comply with the regulations requiring three volunteers on duty for each Speedwatch. Please, please contact Pat Hehir if you can step in to prevent the demise of a team which has worked so hard on behalf of the community for an issue which is of great concern to us all.